Dress up a child's room with this fun, vibrant floral quilt set. The matching quilt and sham, both featuring a bright floral pattern in pink and green, are made of 100 percent cotton and are prewashed and preshrunk for easy care. Inspire sweet dreams with this lively twin-size quilt set. Beautiful 100% cotton quilt, goes perfect with the bed. Purchased for grandkids, so cute! Great quality, really wanted a 'quilt' set, love the fabric and the sham that comes with it. God a Butterfly Flower quilt set for the other bed, goes great! I purchased two sets for my daughter's bunk bed. So far, so good! Seems to withstand normal washing and wear. One thing I would mention is that this has the appearance of a quilt from afar, but close up, most of the patterns are printed on, versus being sewn on or together piecemeal like a quilt. Still happy with it--just wanted to help others set the right expectations! This is adorable. My purchase came with the sham and quilted comforter. I love it. This quilt is beautiful and great quality. My daughter has stained it a few times and all stains wash out. 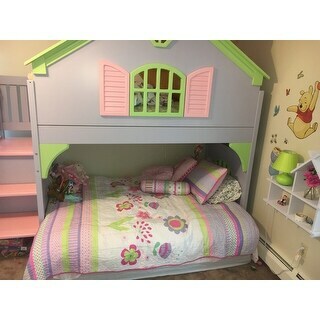 We put this set out on the bed every summer for 3 or 4 years now and it still looks brand new. Cute, thin quilt/blanket for my toddlers room. Many colors make it easy to mix/match. Already sold (quite easily/popular design), since we ended up getting a queen size bed. This is really soft and looks so pretty on the bed. My daughter loved it! We were searching for a lightweight quilt to match her sister's and this way the perfect find. 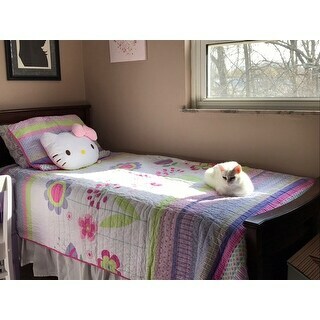 I bought this for my tween daughter's bed. It's made so well, washes well, and is so pretty. She has had it for 2 years now, and it still looks as good as new. Very happy with this purchase. Very soft. If something gets on the quilt and it has to be washed, it comes right out. No soaking. Very soft. Daughter loves it and doesn't like to sleep with anything else. This bedding is perfect for the room we have set up for our granddaughters. And the cats like it too! "Hello! I received my order today and when I looked at the quilt it does not have the solid pink section at the top. The top and bottom are identical with the stripe-like pattern. I like the colors in it but I am disappointed in the look without the pink. Is that an error? Could you please let me know how I should proceed? Thank you!" You can initiate a return for most new and unopened items within 30 days of delivery for a full refund. * You must return items in new or unused condition with all original materials included with the shipment. We must receive your returned items at our processing facility within 45 days of delivery (see Product-Specific Return Policies for exceptions). We inspect all returned items and award a partial refund for opened or used products. If the return is a result of our error or defective product, we will refund the full cost of the merchandise and shipping charges. If you initiate a return after 30 days, we may issue a partial refund* depending on elapsed time and condition of merchandise. "Hello I love it but I need it on full/queen size...do you have it?" This set is not currently offered in additional sizes. "I love this set but I want more shams and the decorative pillows and would love to find a border to match! Can you tell me where I can find these?" Hello Laura, we do apologize, we are not currently in stock with additional items for this set. Please feel free to contact us again with any further questions. Thank you for shopping with us! "What colors is this quilt?" Hello overstockbuyer, we try to represent the colors of our products accurately. Unfortunately, due to the difference in monitor colors we cannot guarantee that the color will match exactly what you see on your screen. In my opinion, this set features pastel shades of green, pink, lavender, and periwinkle blue. Thank you for shopping with us. "Who is the manufacturer of this quilt?" Hello AliciaD, we are unable to disclose the manufacturer of some of our products; however, Overstock.com stands behind every product we sell. When necessary we can contact suppliers if a product issue arises. Thank you for shopping with us. "I also want to order the pillow shams shown in the picture that are on the bed and also the decorative pillows. Is there anyway I can order these or know who the maker of this set is so I can order it." Hello taybug85, unfortunately, we do not have these decorative pillows in our inventory. Thank you for checking with us. Cute set for a little girl's room. It looks perfect for my granddaughter's bedroom. I'm giving this to her on her birthday.